Our research sits at the interface between molecular-cellular biology and nanotechnology-drug delivery. We study the biological mechanisms ruling how our cells and tissues transport cargoes to precise destinations within our bodies, and apply this knowledge to the design of “biologically-controlled” nanodevices for improved delivery of therapeutic agents to specific disease sites (Figure 1). Figure 1. 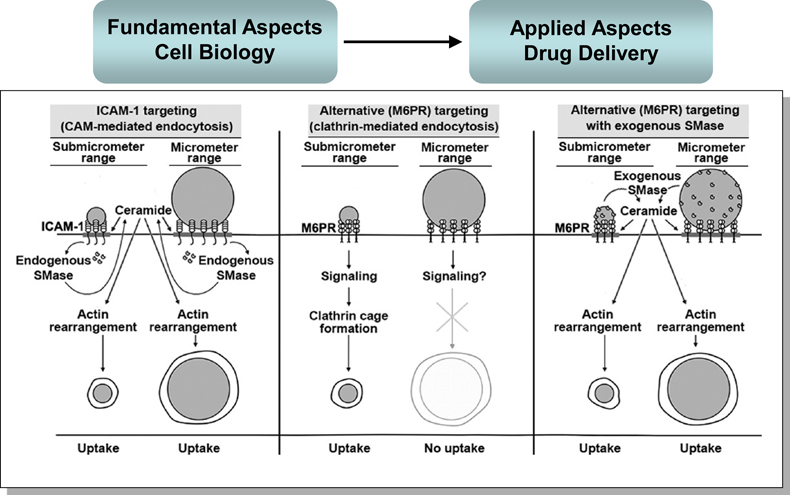 Targeted drug carriers for specific access within the body and its cells. Pictures are reproduced or adapted from the following sources (Copyrights reside on the respective publishers and associated professional societies):  Mane et al. 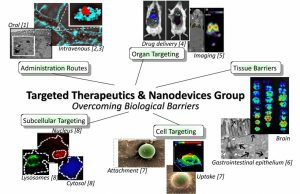 (2012) Int J Nanomedicine, 7:4223-4237;  Garnacho et al. (2008) J Pharm Exp Ther, 325(2):400-408;  Finikova et al. (2008) Chem Phys Chem, 9(12):1673-1679;  Hsu et al. (2013) J Biomed Nanotech. 10(2):345-354;  Rosin et al. (2008) J Nucl Med, 49(1):103-111;  Ghaffarian et al. (2012) J Control Release, 163(1):25-33;  Serrano et al. (2012) Arterioscler Thromb Vasc Biol, 32(5):1178-1185;  Muro S. (2014) Adv Funct Mat, 24(19):2899-2906. A plethora of promising tools are becoming available to tackle health problems, such as new drug carriers or delivery systems, macromolecular assemblies within the nanoscale-size range which can be loaded with diagnostic and therapeutic agents to improve their solubility, dosage, circulation, biodistribution and, hence, overall performance and safety. However, despite such a great advance and promise, our ability to treat diseases such as neurological maladies, genetic syndromes, cancer, etc., remains a major challenge. One of the prime obstacles is our limited knowledge on the biological parameters that regulate the interaction of these systems with our tissues and, hence, our inability to gain non-invasive, efficient, and specific access within the body, its cells, and subcellular organelles. Our lab generates knowledge and tools aimed to improve our ability to deliver therapeutic agents to specific disease sites. Focusing on endothelial cell adhesion molecules as examples of accessible targets and on genetic conditions which serve as models for metabolic, neurodegenerative and cardiovascular syndromes, our ultimate goal is to enable effective treatment for these life-threatening disorders and other maladies characterized by similar pathological traits. Some of our main programmatic efforts are described below. How drug delivery systems are sensed, transported, and disposed of within the body, which is greatly dependent upon biological properties and processes, is far from being understood and much less controlled. Most targeted strategies are designed to achieve specific binding of drug delivery systems to cell-surface receptors, but then they simply depend on the signaling and transport processes the bound receptor regulates in nature. Instead, by deciphering the biological bases of these events, we impart the drug carrier control over biological signaling events independently from the receptor being bound, bypassing the mechanisms, kinetics, and destinations otherwise associated with these receptors. This provides a new and complementary avenue at the interface between the use of novel technological tools to decipher the biological mechanisms that regulate health and fail in disease, and the use of biological knowledge to optimize nanotechnology tools aimed to diagnose and treat human pathologies. For instance, we have shown how even using the same targeting or receptor, the kinetics, mechanism, and destination of a drug carrier can be modulated by: (a) varying its size, shape, and targeting valency; (b) varying the receptor epitope to which the carrier binds; (c) using auxiliary drugs to modulate the endocytic machinery; (d) coupling carriers to signaling molecules that can tune the uptake route independently from the receptor being used (Figure 2); (e) combining targeting to several receptors; or (f) coupling targeting moieties with anti-phagocytic moieties on the surface of drug carriers. Figure 2. Enzyme-functionalization of drug carriers to improve their uptake by cells. ICAM-1-targeted nano- and micro-carriers are both internalized by cells due to natural sphingomyelinase (SMase)-dependent generation of ceramide at ICAM-1-binding sites. Ceramide improves carrier engulfment and membrane invagination, and acts as a second messenger toward actin re-organization, helping endocytic uptake (left panel). In contrast, targeting drug carriers to receptors associated with more size-restrictive pathways, e.g., clathrin-associated mannose-6-phosphate receptor (M6PR), often enables uptake of nano- but not micro-carriers (middle panel). Surface-functionalization of M6PR-targeted carriers with elements mimicking the ICAM-1 pathway, namely exogenous SMases (such as NSM), supplies the necessary ceramide and actin re-organization, improving endocytosis of nano- and micro-carriers even when targeted to receptors different from ICAM-1 (right panel). Reproduced from Ansar et al. (2013) ACS Nano, 7(12):10597-10611. Crossing the linings that separate body and cellular compartments is paramount for efficient drug delivery. For instance, an epithelial barrier separates the gastrointestinal tract from the bloodstream, controlling uptake of orally ingested substances. While certain chemical entities are able to cross this barrier, many therapies do not and their successful utilization needs of means to bypass this obstacle. As for neurodegenerative conditions, they remain largely untreatable because the vast majority of available pharmaceuticals and drug carriers under development both fail to traverse the endothelial barrier that separates the bloodstream from the brain tissue. Another example is that of novel biological therapeutics, which have demonstrated potential to manipulate disease targets far more precisely than their small chemical counterparts. However, these large and fragile therapeutics fail to traverse the membranes that separate the extracellular environment from the intracellular milieu and those of intracellular organelles. We demonstrated that the ICAM-1 pathway (described in the next section) enables transcytosis across epithelial and endothelial linings, which we explore for oral delivery and delivery across the blood-brain barrier. We were also able to target DNA-built dendrimers to cells specifically, whereby these DNA dendrimers enabled endosomal escape and cytosol delivery of a variety of cargoes, including small toxins, carbohydrates (Figure 3), proteins, and nucleic acids. Figure 3. Subcellular distribution of cargo delivered by targeted DNA-built dendrimers. (Left) Illustrative cartoon and corresponding microscopy showing that fluorescent dextran delivered to cells via targeted polymer nanoparticles resides in vesicular compartments (bright red spots) around the cell nucleus (blue). (Right) Instead, much dextran can escape vesicular compartments and reach the cytosol (more diffuse red color) when delivered using similarly targeted “nucleodendrimers” (DNA-built dendrimers). Adapted from Muro (2014) Adv Funct Mat, 24(19):2899-2906. Ghaffarian et al. (2012) Transport of nanocarriers across gastrointestinal epithelial cells by a new transcellular route induced by targeting ICAM-1. J Control Release, 163(1):25-33. During my postdoctoral training, I helped to identify an endocytic pathway induced upon multivalent engagement of the endothelial cell-surface molecules ICAM-1 and PECAM-1. This new transport route is different from most others classically utilized for drug delivery, including clathrin-, caveolar-, macropinocytosis-, or phagocytosis-mediated pathways. My independent laboratory continues to unravel the regulation of this route, particularly focusing on ICAM-1 (Figure 4), and its implications in patho-physiology and drug delivery. The relevance of this new pathway is illustrated by the fact that ICAM-1 mediates extravasation of leukocytes during inflammation, signaling at the immune synapsis, and invasion by some pathogens (e.g., human rhinoviruses). The understanding of this fundamental route and its properties is also advancing diverse drug delivery applications by our group and many others. Figure 4. Cell adhesion molecule (CAM)-mediated endocytosis. 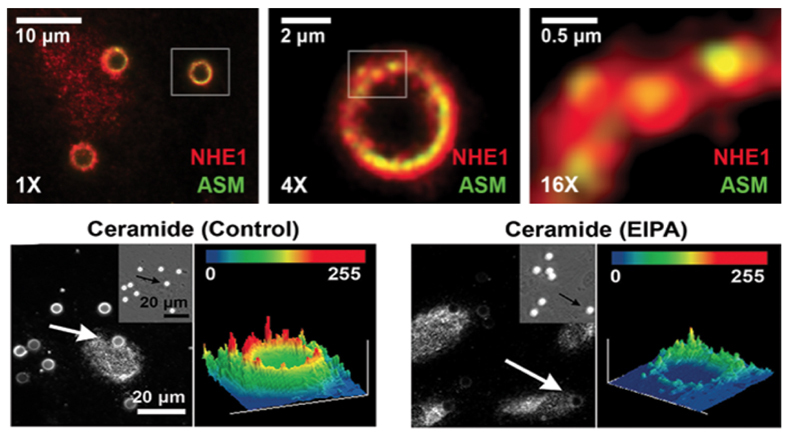 (Top) Different magnifications of microscopy images showing precise co-localization of sodium-proton exchanger 1 (NHE-1; red) and acid sphingomyelinase enzyme (ASM; green) at plasmalemma areas where ICAM-1-targeted carriers are being engulfed by cells. (Bottom) Relative enrichment of ceramide in regions of binding of ICAM-1-targeted carriers to control cell versus cell treated with EIPA (an NHE-1 inhibitor) shows that NHE-1 function is needed for membrane engulfment of said carriers. Adapted from Serrano et al. (2012) Arterioscler Thromb Vasc Biol, 32(5):1178-1185. Monogenic pathologies due to genetic deficiency, such as the case of lysosomal disorders, are valuable models to study disease progression and therapeutic intervention because they have well-known etiology and defined molecular, biochemical and cellular effects, and because patient samples, diverse cell types, and small and large animal models are all readily available. Also, their unequivocal diagnosis enables the tracing of their progression from early to late stages. Since these diseases present with either acute or long-term effects depending on genetic severity, and associate with neurodegeneration, cardiovascular, metabolic, and cancer-like syndromes, they represent excellent disease models. The current lack of efficient therapies to treat these syndromes stems from problems similar to those described above, i.e. our inability to deliver therapeutics to disease sites in need. Consequently, we are applying targeted nanotechnology concepts to the treatment of genetic lysosomal disorders. Current therapies by i.v. enzyme infusion are only helpful for diseases where clearance cells and organs (liver, spleen, macrophages, etc.) are the main targets. Yet, delivery to other organs (brain, lungs, etc.) hinders translation for most diseases. Using types A and B Niemann-Pick (Figure 5), Fabry, and Gaucher diseases as examples, we have shown improved delivery of therapeutic enzymes to all affected organs in animal models, holding considerable translational potential. Figure 5. 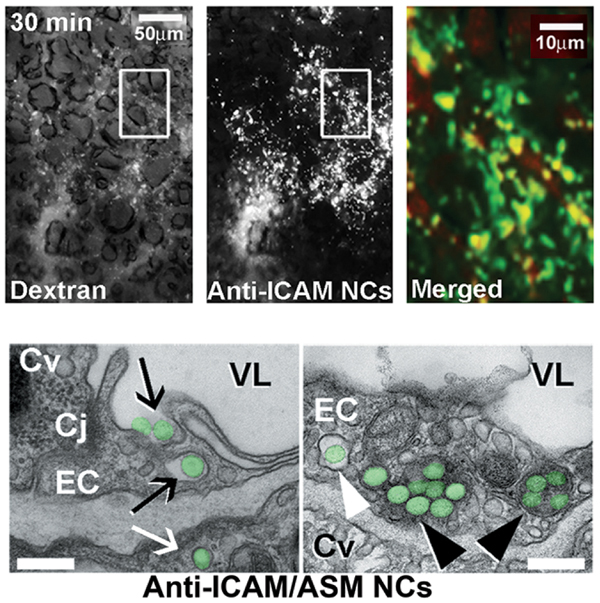 Endocytosis and lysosomal trafficking of anti-ICAM/ASM NCs in mouse lungs. (Top) Polymer nanocarriers (NCs) bearing therapeutic acid sphingomyelinase (ASM) and targeted to ICAM-1 were observed by fluorescent microscopy to abundantly reach the lungs, as observed 30 min after i.v. injection in mice (green spots). (Bottom) Transmission electron microscopy of lungs collected 3 h after i.v. administration confirmed the presence of NCs (green) interacting with endothelial cells (ECs). For instance, NCs can be seen being engulfed by cells (black arrows), within cell endosomes (white arrowheads) and lysosomes (black arrowheads), and transcytosed across the endothelium into subjacent epithelial cells (white arrow). VL = vessel lumen. Cv = caveolar vesicles. Cl = clathrin vesicles. Cj = cell junction. Scale bars = 300 nm. Reproduced from Garnacho et al. (2017) Mol. Ther. doi: 10.1016/j.ymthe.2017.05.014. IBEC gains a new group leader this month, with Prof. Silvia Muro joining the institute as an ICREA research professor to lead her Targeted Therapeutics and Nanodevices group. Dr. Alexander Andrianov, University of Maryland, MD, USA. Dr. Yu Chen, University of Maryland College Park, MD, USA. Dr. Mandy Esch, National Institutes for Standards and Technology, Gaithersburg, MD, USA. Dr. Robert Getts, Genisphere LLC, Hatfield, PA, USA. Dr. Hamid Ghandehari, University of Utah, UT, USA. Dr. Janet Hoenicka, Sant Joan de Deu Hospital, Barcelona, Spain. Dr. Christopher Jewell, University of Maryland College Park, MD, USA. Dr. Joe Kao, University of Maryland Baltimore, MD, USA. Dr. Peter Kofinas, University of Maryland College Park, MD, USA. Dr. Juan Marugan and Dr. Wei Zheng, National Institutes of Health, Rockville, MD, USA. Dr. Vladimir Muzykantov, University of Pennsylvania, Philadelphia, PA, USA. Dr. Gianfranco Pasut, University of Padova, Padova, Italy. Dr. Edward Schuchman, Mount Sinai School of Medicine, New York, NY, USA. Dr. Brigitte Stadler, Aarhus University, Denmark. Dr. Maria Jesus Vicent, Principe Felipe Research Center, Valencia, Spain.